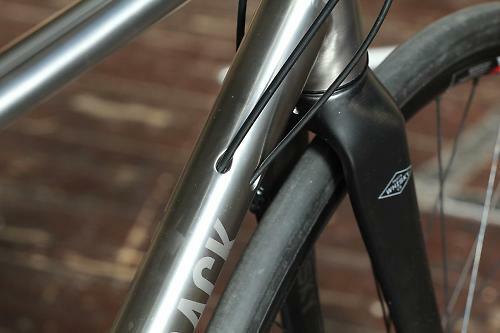 We’ve been eagerly awaiting the arrival of the J.ACK, a titanium disc-equipped road bike from new British brand J.Laverack for some time. Since we published the first look article back in August, in fact. Well, here it is, and isn’t it a lovely thing? 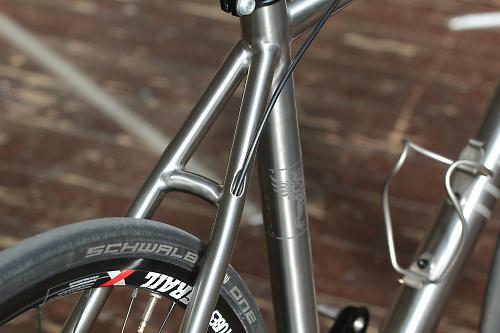 The J.ACK combines disc brakes and a titanium frame with space for wide tyres. It’s beautifully finished, with internal cable and hose routing, keeping frame clutter to a minimum. Even the rear gear cable is routed inside the seat stay, not something we’ve seen before. The tubes are carefully profiled with a tapered squashed oval top tube and curved seat stays providing the necessary disc brake caliper clearance. Up front is a tapered head tube, with a lovely head badge, and down below is a press fit bottom bracket. The frame has a brushed finish with bead blasted decals. 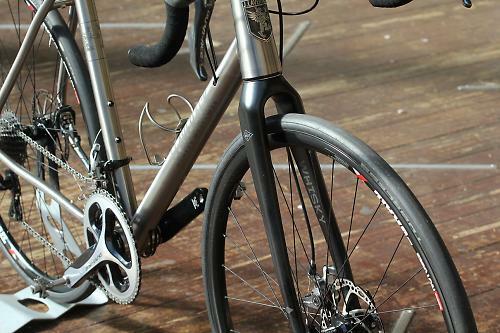 A frame costs £1,500, £1,800 if you add a Whisky carbon fork, and £4,650 as you see it pictured here, built up with Shimano Dura-Ace, TRP Spyre SLC brakes and Hope Pro 2 Evo hubs on Stan’s Grail disc rims. The full spec list is published at the bottom of this article. On the scales, the bike weighs 9kg (19.84lb). But before we delve into too many details, let’s back up a little. 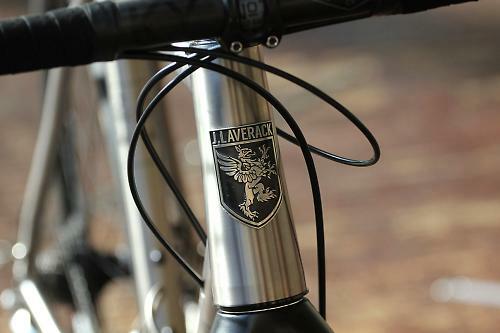 Laverack is the family name and this model is named after founder Oliver Laverack’s grandad, Jack. It was his grandad that got Oliver into cycling and his taste for taking the road less travelled and exploring new landscapes that have driven the design and development of the frame. What are they getting at? It’s a road bike built to be comfortable for longer rides with the ability to take wider tyres, should you want to fit a fat slick or knobbly/semi-slick tyre for exploring byways and bridleways. 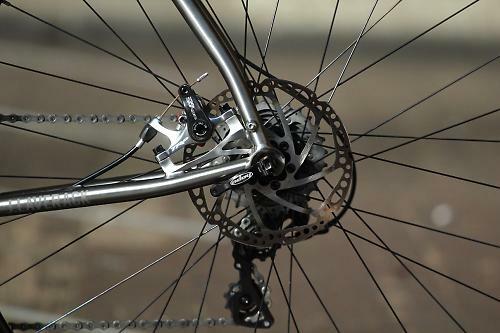 If you value comfort and are sold on the benefits of disc brakes, then this might be the bike for you. Essentially, it looks to us like a modern touring/Audax/adventure road bike. 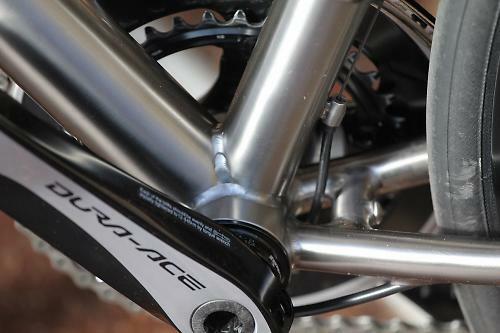 A titanium frame with disc brakes is a combination that is proving popular with British cyclists at the moment. And it’s starting to look like a crowded place, with the new Kinesis GF_Ti Disc, the Sabbath September Disc, Enigma Evoke Disc, Genesis Equilibrium Disc, to name just a handful of British titanium road bikes that fit the same criteria. You really are spoilt for choice. 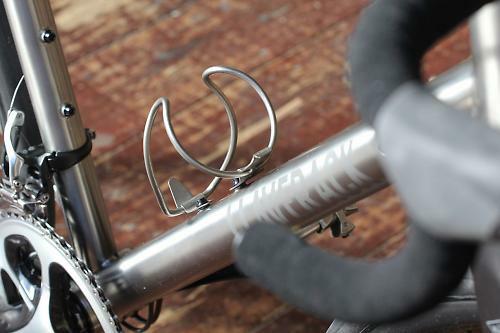 The J.ACK frame takes up to 33mm tyres, 28mm with mudguards. The test bike has 25mm Schwalbe One tubeless tyres fitted to Stan’s Grail wheels, but they balloon out to nearly 27mm, such is the width of the rim. 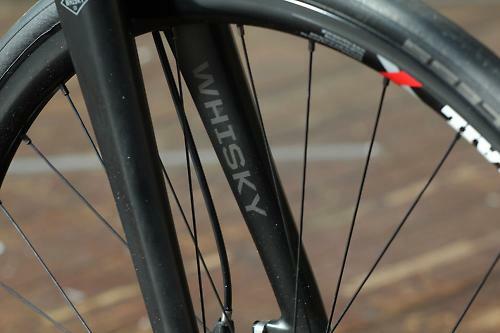 There’s no shortage of clearance between the tyres and frame, and there is similar clearance at the front with the Whisky carbon fibre fork. The frame is offered in eight sizes (48 to 62cm) and this is a 56cm we’ve got to ride here. Some numbers for you: the stack is 583.5mm and the reach is 382.1mm, the bottom bracket drop is 70mm, the wheelbase is 1,010.4mm, chainstays are 420mm and the head angle is 72 degrees. It’s your classic endurance bike geometry with the long wheelbase providing the stability and comfort you want on long rides, and the slacker head angle providing calm steering. The company will soon be offering complete builds based around the same frame, including Shimano 105 with mechanical disc brakes, Ultegra with mechanical or hydraulic brakes, Ultegra Di2 with hydro discs, Dura-Ace mechanical or hydraulic and a Dura-Ace Di2 option with hydraulic disc brakes. Hunt wheels will be specced on most bikes. No prices have been confirmed. Here's the detailed specification for the test bike, which weighs 9kg (19.84lb).